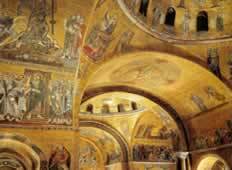 Centuries of commercial and cultural interchange with the eastern Christian Empire had lent earlier medieval art and architecture in Venice a strongly Byzantine character. Many artists from the Eastern Empire worked in the city producing outstanding mosaics, thus transferring their Byzantine artistic tradition to Venice, which became the city in the western world with the deepest connections with Byzantium. When in 1453 the Turks conquered Constatinople, Venice became tacitly the heir of the Byzantine civilization. Many Greeks, especially courtiers, merchants and artists moved to Venice. Among them was a group of painters from Crete who found in the other Byzantine immigrants new patrons for their icons, which became now the symbols of the indissoluble bond with their lost and oppressed homeland. From the artistic point of view, this resulted into a unique reality, where the old Byzantine tradition was artificially preserved in Venice until 18th C, long after Byzantium had ceased to exist. At the same time the Byzantine ironclad conservatism will gradually be moulded by western artistic influences, and the Venetian taste. We will discuss these aspects of early and late Byzantine art while admiring the mosaics of St Mark’s Basilica and the unique collection of Icons preserved in the Byzantine Art Museum.